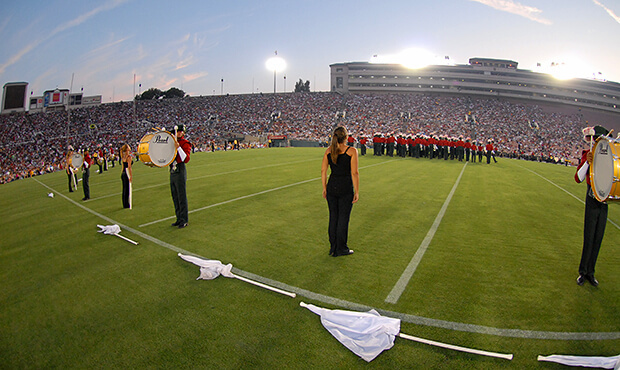 Santa Clara Vanguard will be one of a dozen drum corps that perform at Rose Bowl Stadium in Pasadena this June. A brand new ensemble, the Blue Devils International corps will spend a month touring the Netherlands, United Kingdom, France, Italy and Switzerland this summer. Performance stops for the group will include the world-renown Basel Tattoo in Switzerland. Blue Stars alum John Wasson's arrangement of "Caravan," was used in the soundtrack of the Academy Award Best Picture nominee "Whiplash." Which Bluecoats production will reign supreme? "Marched Madness" pits the corps' productions all the way back to the 1970s against each other in a bracket-like tournament. A new grant will help the Boston Crusaders launch a world percussion program for youth in inner-city Boston. The Youth Education in the Arts Wine, Beer and Food Fest on Sunday, May 3, in East Rutherford, New Jersey, will benefit the Cadets and other programs of the organization. Registration for Carolina Crown's summer series of "CrownLEARNING" educational events is now open. Don't miss this gallery of photos recapping the Cavaliers' February rehearsal camp in Rosemont, Illinois. City Sound will offer a free educational workshop for color guard performers on Sunday, March 15, in Cerritos, California. Crossmen will host an educational clinic for brass students on Saturday, March 21, in Converse, Texas. Featured clinicians will be Francis Franqui and Bill Muter. Newly appointed Jersey Surf Drum Major Chris Pennington talks about what he's looking forward to this season in his second year with the drum corps. Madison Scouts posted video clips from its recent rehearsal camp, giving fans a sneak peek at some of the music the corps will be performing this summer. The Oregon Crusaders' 2015 production titled "The Midnight Garden" will feature musical selections from Sergei Prokofiev and John Adams. Check out this preview video on the corps' Facebook page. Pacific Crest is excited to be hosting a DCI Tour event on Saturday, June 27, at Rose Bowl Stadium in Pasadena, California. This will be the first time since 2010 that drum corps have graced the field of the iconic stadium. Phantom Regiment posted a gallery of photos from the corps' February rehearsal camp on Facebook. Santa Clara Vanguard and the Vanguard Cadets have a number of props, flags, costumes and other equipment used over the last two years for sale. Spartans founder Albert "Berdie" LaFlamme passed away last week at the age of 90. LaFlamme started the Spartans in 1955 and was honored in 1974 with the Service to Youth Award for his work with students in Nashua, New Hampshire. Spirit of Atlanta revealed the title of its 2015 production, "Out of the Ashes."